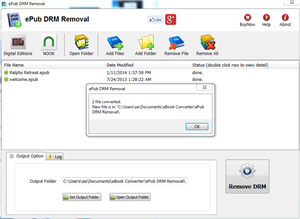 ePub drm removal – Remove DRM Protection, a useful DRM removal program which can remove drm from your purchased or downloaded DRM protected epub, was able to convert to pdf format or other format, at high quality. Thus you can enjoy your ebooks anywhere. It’s time to decrypt those darned Adobe EPUB and PDF’s and rip the Adept DRM out by the roots. 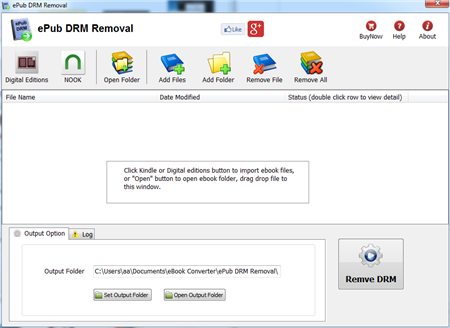 1. download ePub drm removal from ebook-converter.com, this tools has an easy-to-use interface to help new comers get up to speed. 2. Run ePub drm removal, click Digital Editions to import drm epub files into converter automatically, or click “Open folder” to open Digital editions folder, drag DRM epub file and drop in converter. 3. click “Remove” button, a new epub file created without drm protection. 4. Convert epub to PDF format using Calibre, delete origin ebook in Calibre first, then add new drm free ebook into calibre, follow is detail tutorial. There are a variety of options for publishers who want to create digital editions. Some vendors provide a high service model, where publishers can simply send a pdf and detailed instructions to their vendor. The vendor then creates the digital edition from scratch and provides a high quality product the publisher can offer its readers. Unfortunately, high service comes at a high price. This kind of vendor is ideal for a company with a big budget and no time to get involved in creating a digital edition. Digital Edition Converter is a solution that tries to capture the need of many user to convert digital editions to PDF file without the high cost. Using a highly intuitive wizard model, user can converter their own digital editions ebook in about five minutes.